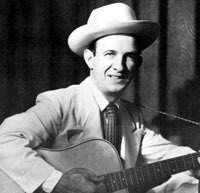 When Jimmie Osborne, the very popular "Kentucky Folk Singer" died on December 26, 1958 of self-inflicted gun wounds at the age of 35, he left behind a great void in the world of country music which is still mourned todaymore than 37 years after his passing. Jimmie Osborne was borne in 1923 in Winchester, Kentucky. He grew up loving to sing and play the guitar. His dad bought him a fiddle, but Jimmie asked him to take it back and trade it in for a guitar. He got his guitar and a neighbor helped him learn some chords and from that point on, Jimmie Osborne's star began to rise. After graduating from high school in 1940, Jimmie married a pretty little blonde by the name of Margaret Lacy. Around the same time, he entered an amateur contest at a nearby high school and won first place, which soon got him a job on WLAP in Lexington, Kentucky. 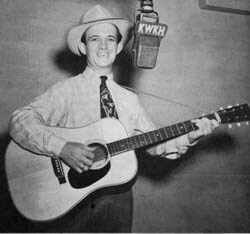 In I946 Jimmie got his first big break and moved to KWKH in Shreveport, Louisiana, the home of the Louisiana Hayride. He worked there with the Bailes Brothers and traveled some 50,000 miles making personal appearances throughout Texas, Oklahoma, Arkansas and Louisiana. He quickly became one of the leading folk singers in the Gulf coast area. 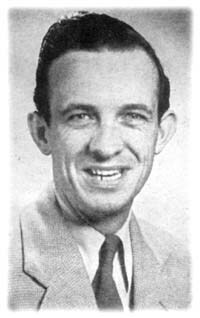 Later in his career, he performed on WSM's Grand Ole Opry in Nashville, Tennessee; WLS' National Barn Dance in Chicago as well as on WLW in Cincinnati, Ohio and WGRC in Louisville, Kentucky. 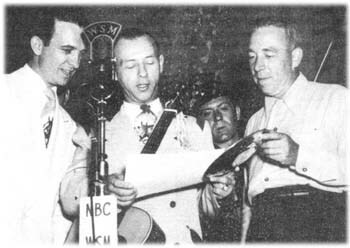 Jimmie did quite a bit of disc jockey work in his time that he spent on radio station WLEX in Lexington, Kentucky. His show was quite a hit with the listeners since he tended to play the songs they most wanted to hear. In September 1947, Jimmie landed a recording contract with King Records in Cincinnati, Ohio where his first recording, "My Heart Echoes" made it to Number 10 on the Billboard Juke Box Survey. Other hits he had included: "Mom Is Dying Tonight", "A Vacant Sign Upon My Heart", "Tears of Saint Ann", "God Please Protect America", and perhaps his all-time greatest recording, "The Death of Little Kathy Fiscus", the tragic, true story of a little girl who suffocated in an abandoned well in San Marino, California. Mr. Osborne received some 2,000 fan letters within three days of the song's release for air play. Yet in the midst of all Jimmie Osborne's life, there was a mystery that no one knew what led him to taking his own life. He seemingly had it all, good, popular, upbeat. The books at the authors' disposal have little or nothing about him or his life, from which one might postulate a conclusion. 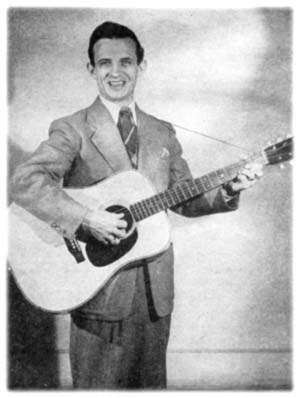 An article in an old Country Song Roundup magazine back in June 1951 said Jimmie was a "...wiry guy, with a smile that lights up his whole face, a smooth singing voice, a knack for playing a good guitar and a keen sense of originality." Back then, he had just joined WVLK in Lexington, KY. In talking about his career and early attachment to the guitar and music, Jimmie was quoted, "...my success is just a big dream come true." "I've got some real friends in Kentucky, and I would hate to ever leave them. However, it's kind of hard to tell what state is the best, for every place I've been, folks have been swell."